November 21, 2011 - Gelek Rimpoche was greeted by many monks and resounding trumpets before giving teachings and the oral transmission of Ganden Lhagyema at Dupthop Rinpoche's Monastery. November 21, 2011 - Kathmandu, Nepal. At the Boudhanath Stupa, the group circumabulated the stupa and enjoyed the many surrounding shops. November 22, 2011 - Kathmandu, Nepal - Vajrayogini Temple - Gelek Rimpoche waves to the group following the Vajrayogini self-initiation they did together. November 22, 2011 - Kathmandu, Nepal - Tara image continually emerging from solid rock. November 23, 2011 - Lumbini, Nepal - Buddha's Birthplace - Gelek Rimpoche and the group gathered for an evening puja organized by the International Conference for Himalayan Buddhism at Buddha's birthplace. November 24, 2011 - Lumbini, Nepal - Buddha's Birthplace - Gelek Rimpoche gave teachings on Morality, seated next to one of Ashoka's Pillars just outside of building housing the location of Buddha's birth. 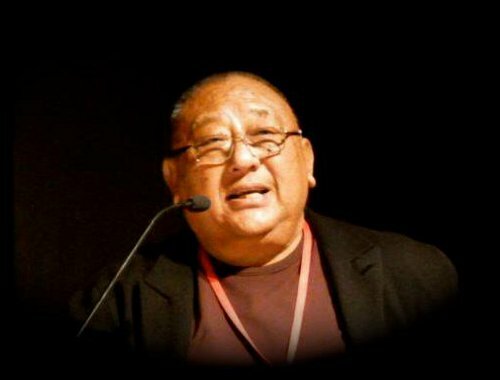 November 24, 2011 - Lumbini, Nepal - International Conference on Himalayan Buddhism - Gelek Rimpoche spoke on the first day of this two day conference in Lumbini. November 24, 2011 - Lumbini, Nepal - A most remarkable setting for the International Conference on Himalayan Buddhism. November 24, 2011 - Lumbini, Nepal - Guest speakers Tashi Densapa Rinpoche and Nangzey Dorjee spoke to the Jewel Heart group in the evening after the International Conference of Himalayan Buddhism. November 25, 2011 - Kathmandu, Nepal - Ven. Tsewang Dhondup joined the group and visited Patan's Durbar Square and the Krishna Temples. November 27, 2011 - India International Centre, New Delhi - Joined by Demo Rinpoche, Gelek Rimpoche continued his teachings on the Three Baskets, focusing on Concentration. November 28, 2011 - New Delhi, India - Many high Rinpoches held an early morning meeting before the Global Buddhist Congregation 2011 session. 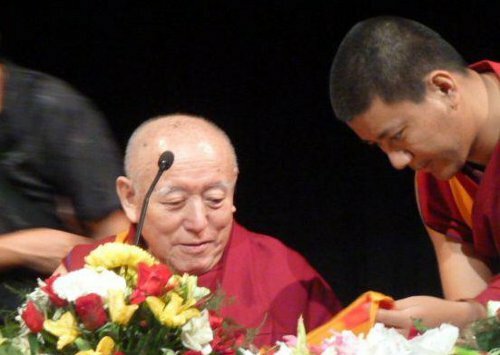 November 28, 2011 - India International Centre, New Delhi, India - His Holiness Ganden Tri Rinpoche taught the Eight Verses of Mind Training, translated by Geshe Lozang Tenzin Negi. November 29, 2011 - New Delhi, India - Global Buddhist Congregation - Gelek Rimpoche introduces His Holiness Denma Locho Rinpoche. 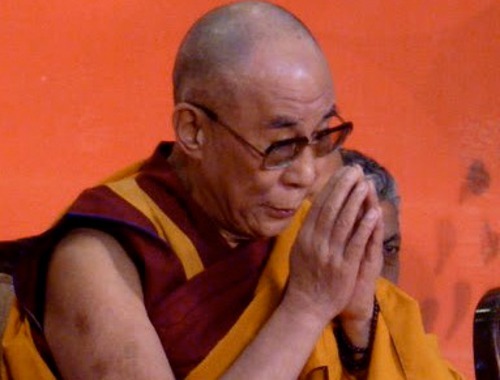 November 29, 2011 - New Delhi, India - His Holiness Denma Locho Rinpoche gave teachings and the oral transmission on the Song of the View Prayer to See the Face of the Mother. 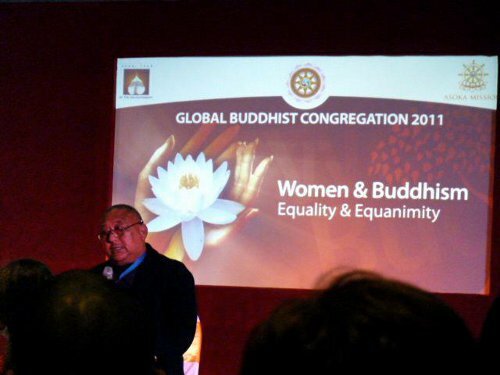 November 29, 2011 - New Delhi, India - Global Buddhist Congregation - Gelek Rimpoche spoke on the Women and Buddhism panel. 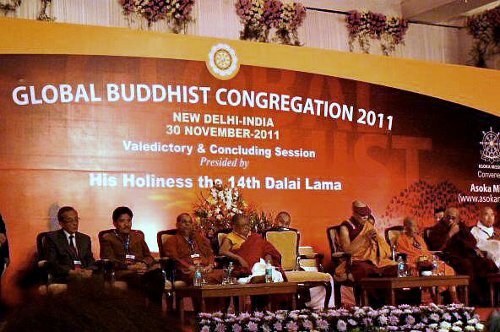 November 30, 2011 - New Delhi, India - Global Buddhist Congregation 2011 - His Holiness the Dalai Lama was the closing speaker of the GBC. 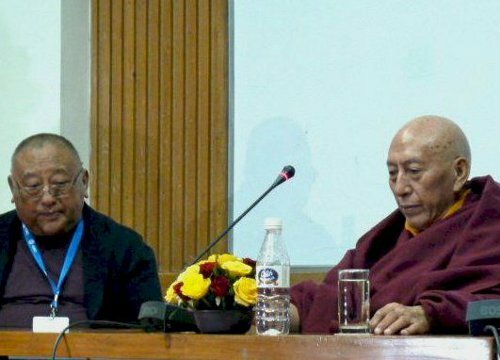 November 30, 2011 - India International Centre, New Delhi, India - Lodi Gyari Rinpoche shared the story of Gelek Rimpoche miraculously leading he and his mother, among many others, out of Tibet. December 2, 2011 - Varanasi, India - The Ganges River - The group took an evening boat cruise on the Ganges River where many diverse events were taking place along the river. December 3, 2011 - Sarnath, India - Dharmapala Temple - Gelek Rimpoche watches as the Buddha's relics are brought out for viewing and blessings. December 3, 2011 - Sarnath, India - Dharmapala Temple at Deer Park was the site of Gelek Rimpoche and Geshe Yeshe Thapkhe's teachings on the Four Noble Truths. December 3, 2011 - Sarnath, India - Gelek Rimpoche and Geshe Yeshe Thabkhe enjoy a few moments together under the Bodhi Tree outside of the Dharmapala Temple. December 3, 2011 - Sarnath, India - The Dhamekh Stupa houses Buddha's relics and is surrounded by many ancient ruins. December 3, 2011 - Varanasi, India - Tibetan Institute - Gelek Rimpoche and the group arrive for a visit to the Central Institute of Higher Tibetan Studies. December 3, 2011 - Varanasi, India - Central Institute of Higher Tibetan Studies - Colorful relief work on the buildings welcome visitors as they enter the campus. 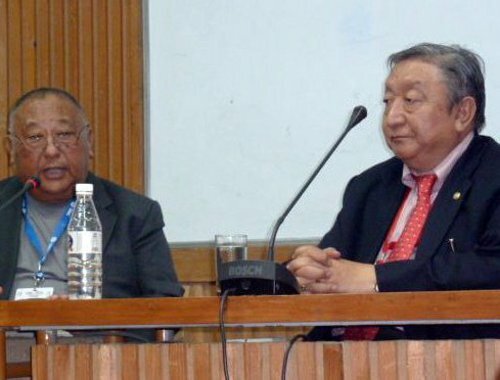 December 3, 2011 - Varanasi, India - Central Institute of Higher Tibetan Studies - Professor Geshe Ngawang Samten - 4 Noble Truths as the Big Bang causing a paradigm shift in Indian culture. December 4, 2011 - Bodhgaya, India - Mahabodhi Mahavihara Temple Complex - Entering the Temple Complex in Bodhgaya. December 5, 2011 - Bodhgaya - Bodhgaya Stupa - Distributing the tsoh following the Lama Chopa. December 5, 2011 - Bodhgaya - The Tara Atisha spoke with when deciding to travel to Tibet. December 5, 2011 - Bodhgaya, India - Gelek Rimpoche gave teachings and the oral transmission of Je Tsong Khapa's Life Story of the Buddha. December 5, 2011 - Bodhgaya, India - The Bodhi Tree where Buddha attained enlightenment.